We removed renter agreement archiving from the quote acceptance process. We added the ability for guests to sign renter agreements after the fact. Many of you have already noticed these changes and have asked some great questions. Here's a breakdown of everything that happened. Previously, when a guest submitted the quote acceptance form, they had to wait while the renter agreement was digitally signed, turned into a PDF and archived with our storage provider. This all happened synchronously as one of several steps before they got a confirmation. In fact, about 75% of the time involved this part of the process. All told, the guest had to sit and wait a good 5-8 seconds on average for the booking to be finalized. While the process worked well and didn't cause any specific problems, we've disliked how long it took. Also, as more vacation rental owners use OwnerRez and the rate of quotes and bookings increases, we are constantly looking for ways we can gain speed as we scale up. With this update, we've removed the renter agreement steps out of the process entirely. Now, when a guest accepts the quote, the process goes right to the final steps of collecting the payment and saving the booking record. 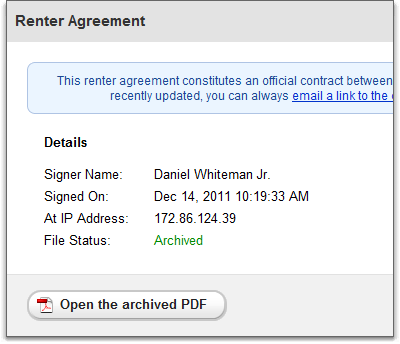 A few minutes later, after the guest has left, the renter agreement is signed, PDF'd and archived by a separate background processes. This change greatly increased the speed of quote acceptance and removes potential obstacles from a scaling point of view as OwnerRez continues to grow. 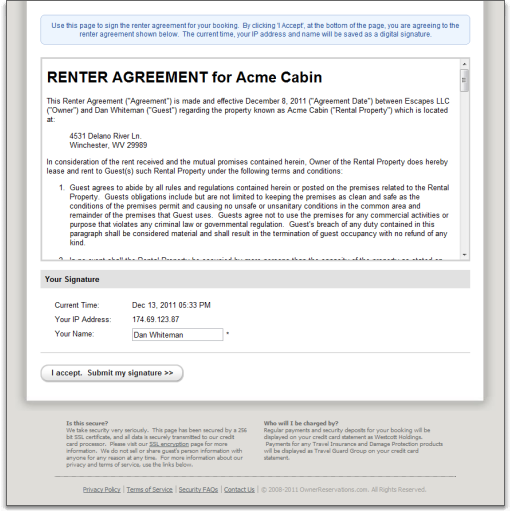 Being able to have guests sign renter agreements manually (i.e. not as a part of the quote acceptance process but in a separate single form) has always been a highly-requested feature by OwnerRez users. This is for an obvious reason: if you create a manual booking, there is never an automatic point where the guest has to sign an agreement. Also, sometimes you need a guest to sign a new agreement after you've made updates. Well, now you can. 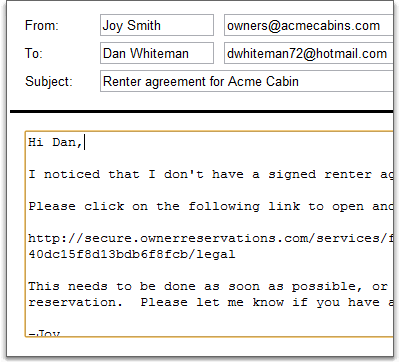 You can send the guest a link which will open a public form with options to sign the renter agreement. You can even do this for bookings that have a renter agreement signed and archived already. Let's see it in action. Navigate to one of your bookings and click on the Legal tab. If the booking already has a signed renter agreement in place, the page will show you the details with an option, as before, to open the archived PDF. If the booking was created manually, you'll see a blank form telling you that no agreement has been signed. Regardless of which version you see, at the bottom of the page there will be an "Email a link to the guest" option. Click on that link and an email form will open. A default message will be pre-filled for you, but you have the option of changing the message just like every other email form in the system. 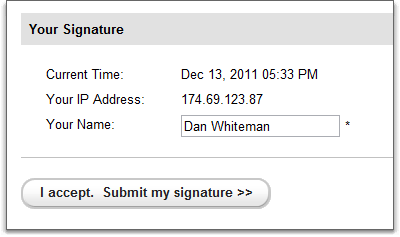 You'll notice that the default message includes a link to a public form that the guest can use to sign their agreement. If you wish to see what the guest will see, open that link in your own browser. You'll notice that the public form is very similar in design and layout to all the other OwnerRez public forms. Underneath the renter agreement body, the guest is presented with several fields that show them what they're signing. They are then free to sign the agreement as they choose. Once the guest has submitted the form, the signing, PDF'ing and archiving process is exactly the same as the quote acceptance process. After a few minutes, the background process will finalize everything and you (and the guest) will receive confirmation emails. We have a number of ideas in the pipeline about how to improve the renter agreement process even more - such as allowing you to upload files that the guest faxes/emails to you - but we're also interested in your feedback. Please let us know what you like or dislike about these changes and what you'd like to see in the future.